Are you one of those people who thinks making homemade potato knishes from scratch is difficult? I used to think so. Then I made them. And I realized it’s a lot easier than I imagined. I guest posted the recipe and some instructional photos on The Spiffy Cookie. Check it out here. Thanks for the great guest post! You make them look so easy to create. Thanks. I tried these, and gata say they are probably the best potato knishes I ever had!! I made these tonight (16 more minutes in the oven…) and have a pretty significant amount of filling leftover. Any suggestions on ways to use it up? I can’t wait to hear how you like them! I’m surprised you had extra filling- the original recipe called for 8 potatoes and I wound up making an extra batch of dough because I had so much extra filling so I scaled it down. You can try adding some extra egg and flour to make “doughless” knishes. Bake it either in balls or in a loaf pan. I’m glad you liked them Tali! Sorry about the filling. Let me know what happens if you bake it. omg! I haven’t had a good Potato knishe since I left south Florida 13 years ago, can’t wait to try!!!!! Thank you! 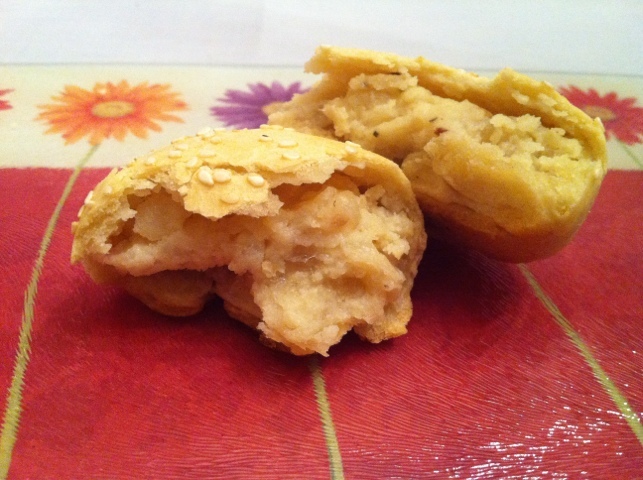 hi i cant seem to be able to get the recipe,tried the link but cant find it there…..id really like to make them…. Click the second link… it definitely works. Got it tks! Will try it tom! Can I freeze them? And if so how I re warm them? wow! these tasted & look so authentic! I used 1/2 C oil instead of the margarine and turned out great! thanks for the great recipe!